Tyson Foods, one of the largest meat suppliers on the planet, was forced to cut ties with a Denver-based pork provider after undercover footage taken by the Humane Society revealed deplorable levels of barbaric cruelty. Tyson misleadingly claimed to have no connection with Wyoming Premium Farms. 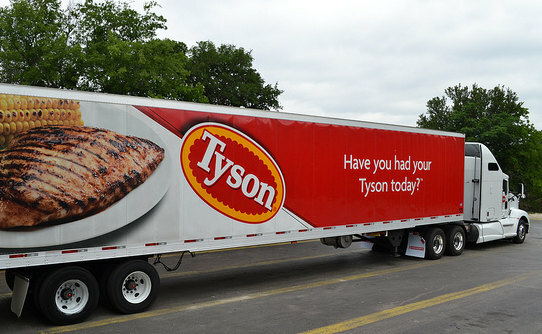 However, evidence collected by the Humane Society of the United States (HSUS) eventually pushed Tyson to take accountability, resulting in an announcement from the company that it will temporarily suspend shipments from the pig farm while conducting an investigation. These types of incidents are unfortunately very common in the world of industrial agriculture. For example, in June 2011, Mercy for Animals uncovered hellish conditions at Iowa Select Farms, the largest farm in the state. The investigation found not only gestation crates in use, but piglets being carelessly thrown around, many of which were laying on the ground with untreated, open sores. One year prior, in 2010, the Humane Society released a video depicting cruelty at a farm owned by Smithfield, a major pork supplier. That investigation also found sows in gestation crates, along with injured/sick pigs left to die without treatment. Many states are considering laws -- or have already passed them -- which make it a crime to take an entry-level job at a farm with the intent of documenting animal welfare abuses. Such legislation has (perhaps unsurprisingly) been heavily backed by the meat industry. In the age of internet, where information travels like a swift fire on brush, keeping a lid on animal welfare issues has apparently become a priority worth investment to the meat industry, which seems to find cruelty more profitable than exposure and correction. When animals are viewed as trivial products -- mere cogs in a giant machine -- is it really so surprising that this kind of blatant abuse is so widespread?